Our wands are used worldwide by Airlines, Airports, Aircraft Handlers, Fire Departments, Police, Military, Marine, Hotels, Entertainment Venues, Sporting Events, Parking and more. Our wands are operating in extreme cold weather, hot weather, desert, humid and wet environments every day. We at Zaviation sell and ship our wands worldwide. Contact us today. Our Heavy Duty Safety Wands has become the industry standard wand used worldwide. This durable, reliable, multipurpose tool is a must have for aircraft marshaling, road safety, fire departments or any other application where you may need a safety wand. After years of research and development, this new design is the best and brightest Marshaling/ Director Wand on the market. Made with reinforced PP and PC for super strength, using Stainless Steel internals eliminates rust, and we use only the brightest Commercial Quality LEDs, this product is superior to the rest. Its sealed mechanical switch makes it easy to use, with no assembly required. The Safety Wand HD is water, spark, rust and grease and shatter resistant, equipped to handle anything you may throw at it. The Baton Brite Wands have been used worldwide for many years. PolyBrite’s LED Baton offers the most professional and advanced illumination for signaling on the market. PolyBrite’s unique polymer/LED combination used in the baton is visible up to one mile and provides unsurpassed battery life. The waterproof, three-way function switch and large glove friendly button make this the ideal tool for illuminating, signaling, directing and marshalling. The Baton is lightweight, extremely durable and safe to operate in adverse weather conditions. Ideal for and used by Military, Police, Airport, Marine, Auto Emergencies, Road Construction Crews, Parking Attendants and Pedestrian Safety personnel for directing traffic and capturing attention. Its revolutionary, patented design, incorporates rechargeability, multi-intensity lighting (including flashing), and offers solar charging and remote control options. It is both user and environmentally friendly, encompassing the latest advances in electronic and battery technology. The standard system consists of 2 SEAL Lites, supplied in a carrying case. This enables the system to be stored and charged simultaneously, via 12V supply (vehicle lighter socket) or mains electricity. Our products comply with relevant CAA, FAA and ICAO specifications, ensuring quality that is second to none. The S.E.A.L. Wand Bundle contains a pair of S.E.A.L. Wands, Carrying Case and Mains Charger. 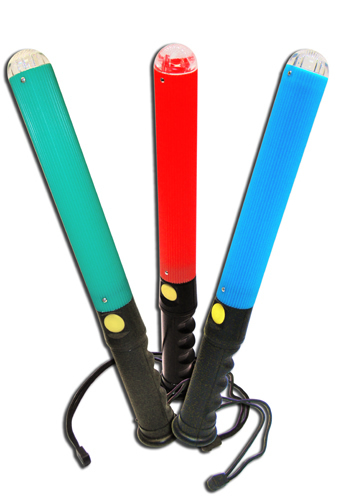 Our Flashlight Wand was the industry standard wand used worldwide for decades. This durable, reliable, multipurpose tool is a must have for aircraft marshaling, road safety, fire departments or any other application where you may need a safety wand. 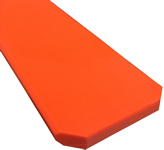 This orange slip on wand cover converts most flashlights into a marshalling wand. Our Flashlight Wand Tip was the industry standard wand used worldwide for decades. This durable, reliable, multipurpose tool is a must have for aircraft marshaling, road safety, fire departments or any other application where you may need a safety wand. Our daytime wands are used worldwide. Our daytime wands save the wear and tear of your night wands during daytime operations.